The third Boat of Garten Steam Fair, held in association with the Strathspey Steam Railway, took place on the 19th and 20th July and was another success story. By all accounts from staff at the Boat, numbers were up on last year and not surprising the wather didn’t really play ball, Typically the sun poured its heart out on Monday morning. This year 7 full size engines and 12 miniatures made the journey. Noteable two new faces at the Boat were Derek & Vivien Hubbock up from Hexam with their 1937 Fowler Traction Engine and Geoff Baker from Blackburn with his static matched pair of horizontal steam engines, made by George Waller & Sons of Stroud in Lincolnshire around 1820. Joining the engine were two moniature railways, the first was Ronnie Kennedy with 5″ guage steam loco ‘Sweatpea’. The other was Dave Watt and Mick Walton assisted by Ian Smith witha 101/4″ guage railway with engine ‘Tich’. On top of that there were threee displayes, one each by the miniature railway lads and the third by Andrew Souter from ABerdeen witha 58! model steam engine. Not to leave the miniature engines out, here is teh names that attended teh drinking den on Saturday night. Kenny Rogers, Alisder Foster, Harry Clynne, Bob Lawrie, Martin Johnston (Boat resident), Stan Atkinson, Jim Low, Gavin Low, Martin McGorry (ringleader), Michael Clark and last but not least Malcolm Kirby who can’t pour a proper pint. Two steam trains all weekend taking punters from Aviemore passing each other at the Boat to Broomhill. 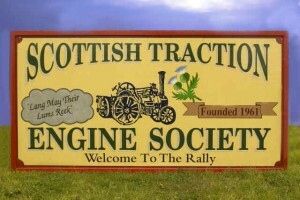 The Strathspey organisers had put on a small display of vintage tractors at Broomhill. As always, there was a parade on Sunday afternoon up into the square with all engines taking part being led by the pipe band. Some of the tractors from Broomhill came down to take part in thsi as well and then it was back to the yard to pack up and go home, hopefully to do it all agin next year.